Lawyers’ Professional Indemnity Company (LAWPRO) is committed to acting in accordance with Canada’s Anti-Spam Law (CASL). This policy applies to all Commercial Electronic Messages (CEM or CEMs) as defined by CASL that are sent by LAWPRO. Generally, CEMs are messages that encourage participation in commercial activity. For example, a CEM might include messages that offer to sell a product, goods or services. Many messages that LAWPRO sends are not CEMs. In particular, messages that we send you in connection with the operation of the mandatory professional liability program for the Law Society of Ontario are generally not CEMs due to the regulatory/mandatory nature of the program. When we send you a CEM for which CASL requires that we have your consent, we will do so with your express or implied consent. An example of implied consent would include where we have an existing business relationship with you. In certain cases where we send you a CEM, you may opt out of receiving future CEMs from us by letting us know. To do so, you would advise us through the email address provided or by clicking on the “unsubscribe” link. We will respect your opt-out instructions for CEMs. 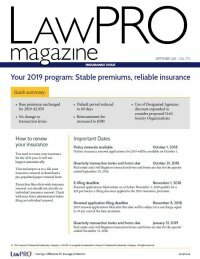 However, because we are required to communicate certain types of information to our customers in accordance with contractual or other legal or regulatory obligations, you may still receive communications from LAWPRO electronically even if you unsubscribe. LAWPRO encourages you to contact us with any questions or concerns you might have about our Anti-Spam Policy or processes. We will investigate and respond to your concerns.